The New Orleans Charter Science and Mathematics High School (top left) and Samuel J. 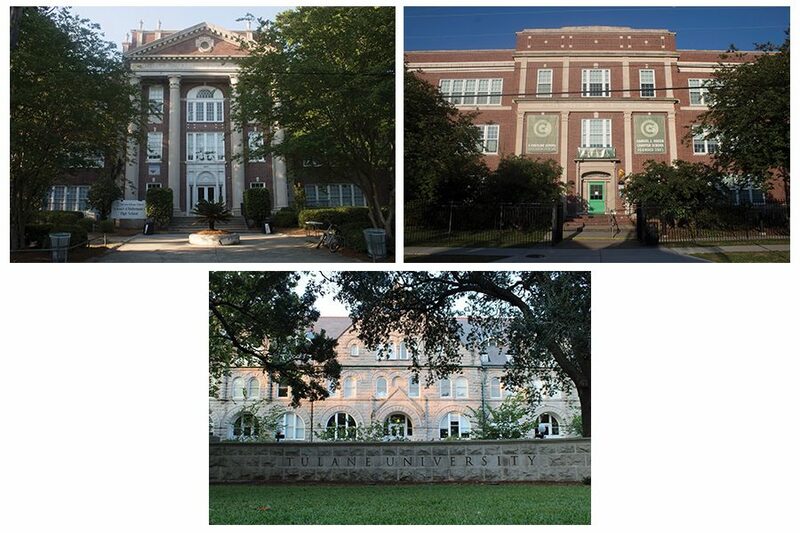 Green Charter School (top right) are located near Tulane in Uptown. Tulane-affiliated initiatives work with these and other local schools to advance education in the city. For the first time in a decade, citywide school performance has dropped in New Orleans, according to a recently released State of Public Education Report by Tulane’s Cowen Institute. The Cowen Institute is a Tulane-sponsored entity formed “to advance public education and youth success in New Orleans and beyond,” according to the institute’s website. It is one of several Tulane-affiliated programs, offices and initiatives broadly aimed at supporting public education in the New Orleans area. These include the Education Research Alliance, the Tulane Teacher Preparation and Certification Program, the Center for Public Service and Upward Bound. “I think as a world-class research institution and as one of the largest employers in the city, Tulane has a really important role to play in advancing education,” Amanda Hill, executive director of the Cowen Institute, said. 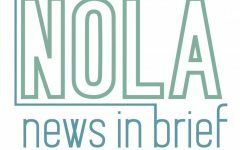 Dubbed “The Experiment” by journalists and education scholars, the current education system in New Orleans was designed in response to the perceived shortcomings of the pre-Katrina education system. Now, almost all schools are charters – publicly funded and privately managed. Tulane has refrained from endorsing any particular education policies in New Orleans. There is a perception, however, that Tulane and its affiliates are pro-reform. 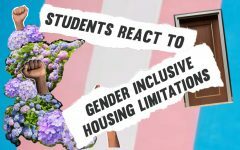 According to Associate Professor of Political Science J. Celeste Lay, this perception does not hold up to reality. Instead of getting involved in the politics of policy, Tulane engages with education stakeholders primarily by providing research and student volunteers at local schools. Tulane often emphasizes its commitment to public service. According to Bridget Smith, assistant director of the Center for Public Service, at least half of service-learning courses involve working with local youth populations through school and after-school programs. Smith said the majority of CPS-facilitated service-learning projects involve tutoring in local schools, while other projects include Tulane students presenting lessons to local public school students. Sophomore Kyle McIntyre has worked with local students on two different Tulane service-learning projects — one where he tutored students after school and another where he and his classmates taught international relations concepts to students at Homer A. Plessy Community School in the French Quarter. Sophomore Jenny Ly worked as a reading buddy and teacher’s aide at Lawrence D. Crocker College Prep for one of her service-learning projects. Prior to beginning their service, McIntyre and Ly participated in CPS-led preparation. Some students and faculty suggest this training is insufficient. Additionally, Ly said she noticed local students may have been negatively impacted by uninvolved volunteers. Because so many Tulanians are involved in local education, some community members have asked students to consider the complexities of the system before they take a role in it. Another way Tulane students serve in local public schools is through Tulane’s Teacher Preparation and Certification Program. The program trains undergraduate students for teaching careers and certifies post-baccalaureate professionals who want to become teachers. For Ly, LeBlanc and many of their peers in TPCP, student teaching opportunities solidified their choices to go into teaching. Blady, Ly and others involved in TPCP, however, said they recognize that they are working in a rapidly changing field. The Cowen Institute 2018 State of Public Education Report finds that that 50.7 percent of the city’s teaching population is African-American. This number is lower than the pre-Katrina percentage of African-American teachers, which was 71 percent in the 2004-05 academic year. 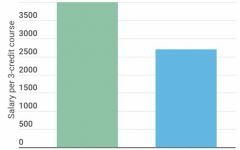 It is also lower than the percentage of black students enrolled in New Orleans public schools, which is 79.9 percent as of this academic year. Because the Tulane administration and student body are tied to public education and organizations like Teach for America, Tulane is critically evaluating the challenges faced by the city’s schools. “The good news is that while [the changing field of teaching] is such a critical issue and we do have teacher shortages and demographics have shifted, we also see universities, nonprofit partners and the government coming together to say we’re going to do something about this to ensure that students have high quality teachers,” Hill said. At the core of many discussions about education in New Orleans, including those related to the shifting demographics of teachers and the dynamics of Tulane service-learning projects, are questions of race, socioeconomics and equity. 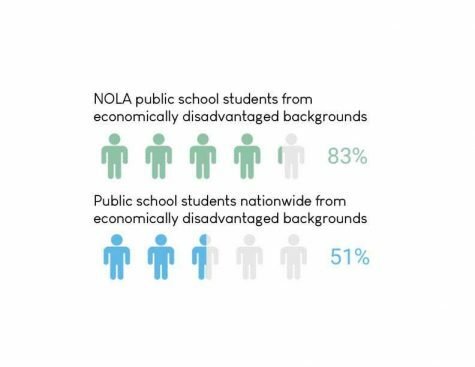 83 percent of New Orleans’ public school students are from economically disadvantaged backgrounds, compared to 51 percent of public school students nationally. Given this fact, sophomore Matthew Weber, who is from New Orleans and attended Benjamin Franklin High School, said he agrees that there is more to remedying education than test scores. Hill said equity is at the helm of the Cowen Institute’s work and added that she is hopeful Tulane’s education-oriented initiatives will prioritize equity in the future. Tulane-affiliated offices and initiatives seeking to advance public education must navigate complex issues of equity and a changing teacher workforce. According to some in the field, Tulane must address the perceived lack of trust between its programs and the community. Barrett said Tulane could build trust by engaging with the community and building a relationship that isn’t “top down.” For some students, however, rebuilding trust between the community and Tulane when it comes to education must consist of more inclusive and proactive admissions practices. “Tulane is like a city on a hill, something you aspire to, but you don’t really believe you’ll ever go there, because most people don’t have the option, even if they have the option,” Weber said. Ly, who grew up in Jefferson Parish, said that despite her high school being only a few miles away from Tulane, she is one of two students from her graduating class that enrolled at Tulane. 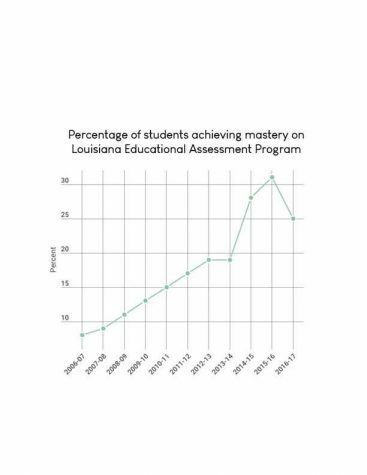 According to the Office of Admission, it has several programs aimed at addressing inaccessibility of education for disadvantaged students in the New Orleans area. 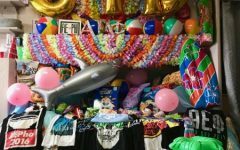 Some of these programs include Tulane admission counselors visiting local high school college fairs, hosting application workshops for local students and flying in students for PreviewTU. Because of Tulane’s far-reaching presence in diverse aspects of education, some members in the field said that the University and its affiliates are well-positioned to elevate public education in New Orleans. Currently, Tulane’s education-oriented organizations lack centralization. According to Blady, these organizations could be more effective if they worked together. 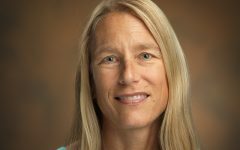 “I just think we need more of a hub so that we can all kind of help each other and support each other and know what each other’s work and research is about,” Blady said. In addition to coordinating efforts across Tulane’s many public education-related entities, Barrett and others said that public education remains a complex issue and that researchers and advocates must consider many potential ways forward. Ultimately, he said, there is no magic remedy for improving educational opportunities and outcomes.